In business, cash flow is king. Our Payables Analysis Solution provides rapid insight into your accounts payable. Other than offering a historic visualization of payments by groups, vendors and currency, our solution indicates the overdue amounts by aging groups, vendors and currencies. Manage your cash flow better by staying in the know with your Accounts Payable. Call us today to discuss how to turn your HR data into a compelling interactive story. Our friendly team of BI consultants will help you with a free requirements analysis and discuss how best to ensure your reporting goals are realised. Share The Awesomeness, Choose Your Platform! Johann is brilliant. The Data Bear solutions are just fantastic. The quantifiable improvement to any business using their Power BI Dashboards are worth 100 times more than the investment. Great stuff. We have been working with Johann and Dmitri for almost a year now. From concept to design and implementation, they have been nothing but professional and timely. 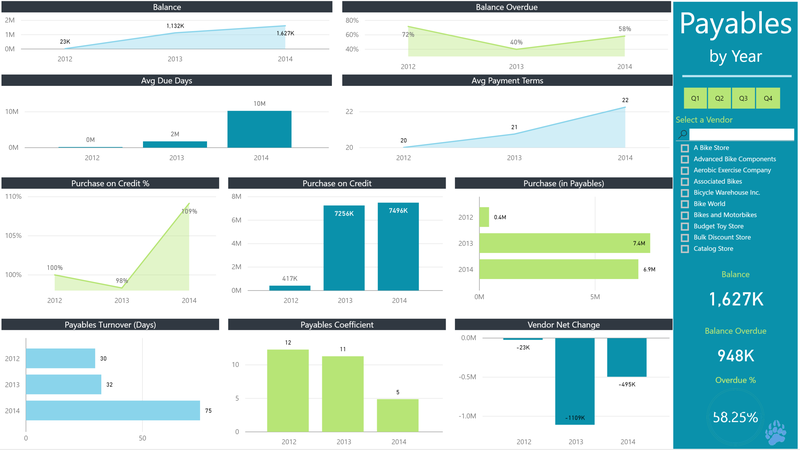 They leveraged Azure and Power BI to sort and report our point of sales data. We have no reservation when it comes to recommending Data Bear and look forward to our continued partnership. The DataBear team has been great to work with! They take the time to understand the problem and then put together a real-time solution. It's also great when they responds so quickly! We will continue to work with them! Fantastic experience. Very customer oriented - in helping us think through our needs, suggesting solutions and then delivering on a great solution. Great guys to work with! Extremely professional and easy to work with. Highly knowledgeable on all aspects of Microsoft Power BI issues and solutions. Would strongly recommend. Johann and the team are a great resource if you are looking to implement Power BI. He has worked closely with the team here at Appdopt and they provide powerful insights! Incredible trainers. Very knowledgeable. Took me from zero to very decent level in no time. I'd highly recommend using them for your data modelling and training needs. Fantastic training delivered clearly and effectively. Training was delivered at a pace that reflected our individual abilities and Johan ensured everything was clearly understood before moving on. Would happily recommend! Great Power BI training provider – very professional and knowledgeable. I would highly recommend. Very professional training from Johann who is highly knowledgeable, giving to the team great insights to project our use of Power BI. Highly recommended. Great Power Bi training in London. A very comprehensive overview of this platform with a thorough agenda, good training materials and a friendly group; Johann is an excellent trainer with a great depth of knowledge and experience in Power Bi. Highly recommended. Johann provided excellent guided instruction and inspired the candidates to be excited about the possibilities of taking the learning away to implement. DataBear were a pleasure to deal with. We had a 2-day training workshop at our own location, Johann was very knowledgeable, not only delivering a well structured and organised piece of training, but also able to answer questions quickly. Thank you for a superb experience. I recently attended the 2-day Power BI Course run by Johann. This was an intensive and extremely valuable course. Johann is a great instructor, he knows the subject well, and his pace is spot-on. There were many clear and easy-to-follow examples, and the emphasis on practical learning makes this a very worthwhile two days. I would recommend doing the three day course however, as there is so much content and I left wanting just a little more exposure to the final module. Many thanks Johann! Being new to Power BI I was keen to organise some training for our UK data team. After some Googling I decided on Databear and gave them a call. Johann promptly called me back and we discussed the various training options and we arranged some onsite training to be held at our own offices. Johann provided two excellent days of training, full of knowledge, insight and explanations. With Johann you get right in to using the tool and apply what you are learning as you go. I would highly recommend Johann to anyone interested in learning how to use Power BI correctly and effectively. I attended the three day PowerBI training course with Johann and found it extremely valuable and insightful. Johann has an excellent knowledge of the subject and the lessons are well structured. I would recommend people take the opportunity to learn and grow their skills through Data Bear . Data Bear came in to run a two day course on Power BI, the attendees were from various levels of excel experience, but Johann kept the training relevant to all levels and made sure to carry everyone along. a very good way to start your Power BI journey. Excellent intensive, small group two-day course - best practise on data modelling was the most valuable section for me as this underpins the success of everything you could possibly want to achieve in Power BI! Highly recommend for those who have go their teeth into Power BI already and want to produce more effective and efficient work but also great for complete beginners as Johann will adapt to suit your needs, even in a mixed group. Very structured, well delivered, convenient in terms of timing and location course! I really had a great value for money n this course! Thanks Johann, will definitely recommend to colleagues! I have just attended a 2-day PowerBI course ran by Johann. The course is very comprehensive and intense. I would suggest anyone who plans to attend the course to have some basic idea of PowerBI first. This will make the 2-day less daunting. Having said that, Johann was super helpful and patient both during and after the course. A classroom course beats any online course hands down. Had a fantastic three days with Johann, and would thoroughly recommend to anyone looking to improve their PowerBI skills. His (and Data Bear's) approach to training is very intuitive and helps with real-life examples. The training was adapted to the areas I required further guidance on which provided a very, very quality experience.Happy to say I will be undertaking further training with Data Bear in the coming months. Great course! My colleagues and I had a private 2 day training with Johann. The course was exactly what we were looking for in order to get a solid understanding of PowerBI. He took us from zero to a level where we feel confident enough to start creating our own reports. He was happy to deviate from schedule, answer all our questions and tailor the content based on our needs. Highly recommended! Very Well Structured course! Excellent introduction to PowerBI and not only! Johann puts a lot of time in the foundation of data models, which helps to change mindset from spreadsheets to organized data. He is very knowledgeable and happy to discuss and assists with custom problems. I highly recommend this course. I have almost 20 years working in BI and DWH and my previous experience of Power BI was not a positive one, however by the second day Johan had changed my opinion to a positive one. It was nice to be pleasantly surprised. Johan was professional and worked in well with all levels of experience on the course and I would happily recommend Data Bear as a course provider in future. Johann delivered a great course which appropriately catered for both beginners and experts. His deep knowledge of Power BI was very apparent which has helped me better understand both how I can use Power BI in my role and also how I can better design and organise our company data in order to realise the full benefits of Power BI. Have existing Power BI reports? Does Your Model & Design Follows Best Practice?